All of the storage space available in the sleek wood cabinets allows this skinny kitchen to stay uncluttered and organized. 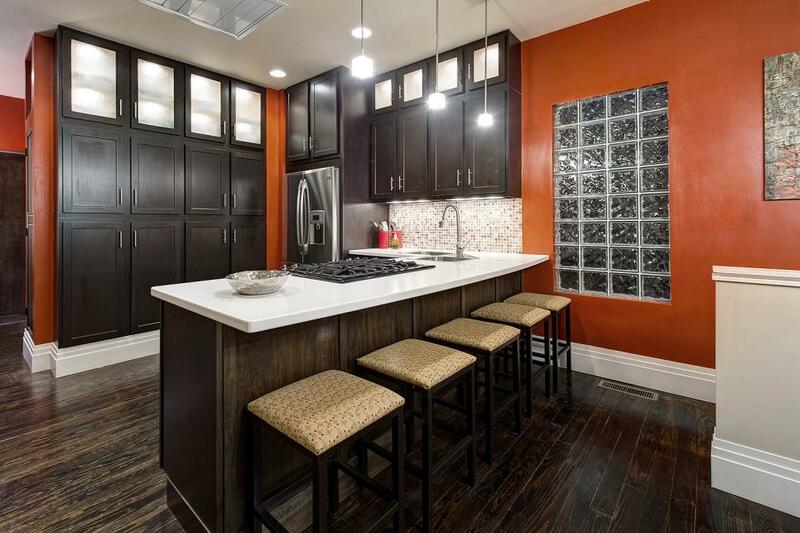 The unique hardwood coloring adds depth to the smooth white countertops, orange walls and stainless steel appliances. Frosted glass doors on the top layer of cabinets add a bright detail that complements the hanging, square pendant lights. 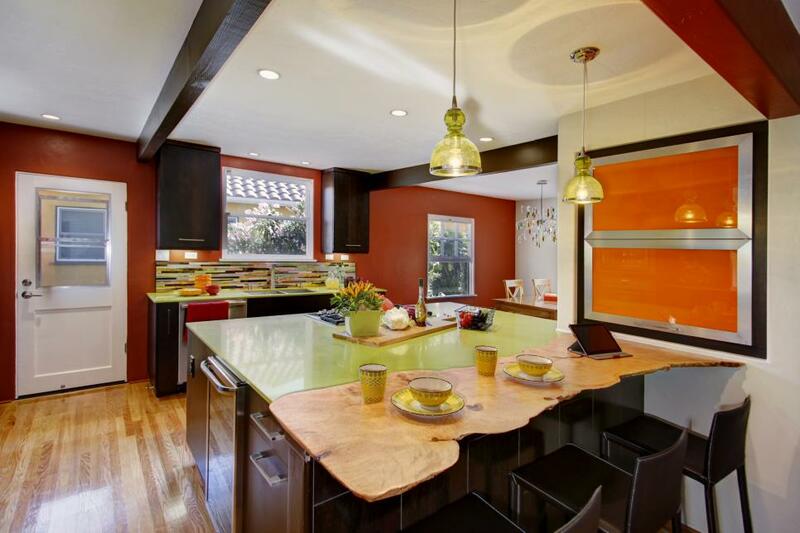 Bold orange walls provide contrast against dark wooden cabinets in this contemporary kitchen. Three art panels decorate the neutral wall facing the kitchen, adding texture to the sleek room. Pendant lights hang above the white peninsula countertop, illuminating the casual eating space. 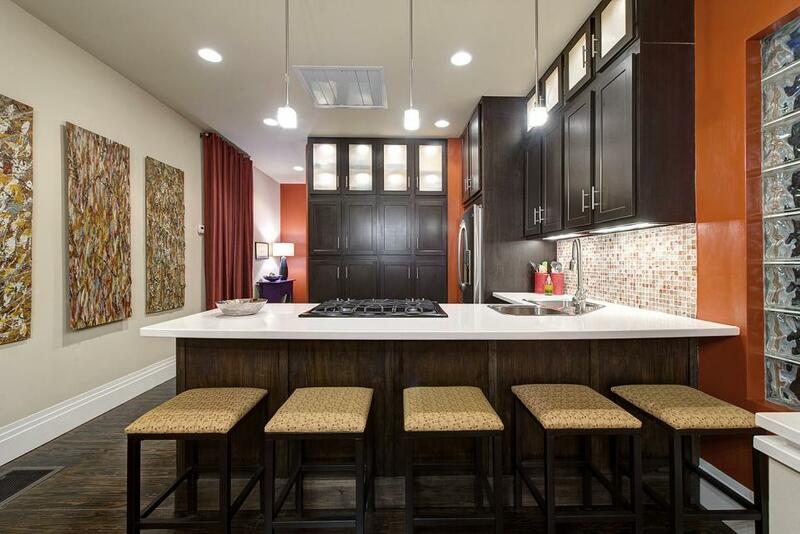 This bright, eclectic kitchen features a burnt orange accent wall, neutral countertops and dark brown cabinetry. 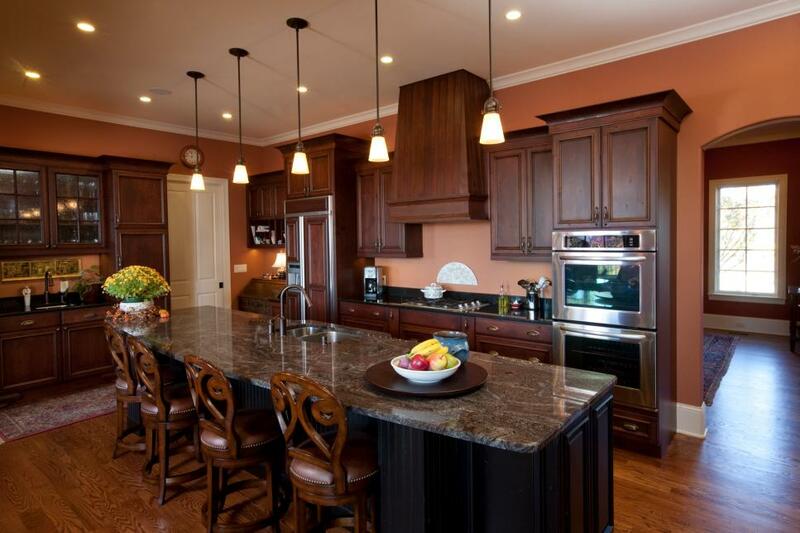 An extended countertop from the island provides a spot for eating breakfast, lunch and dinner. 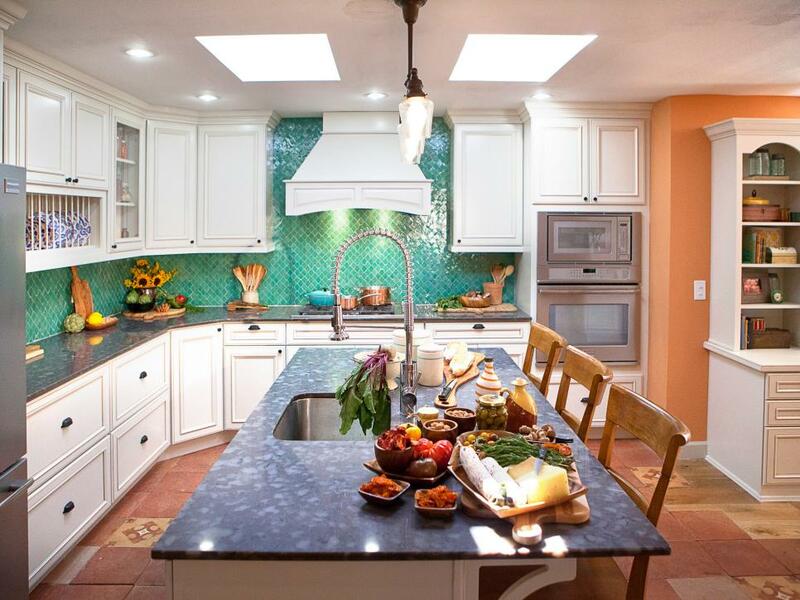 Designer Kari McIntosh Dawdy transformed this kitchen with bright colors and accents, giving this 1920s home a more contemporary feel. 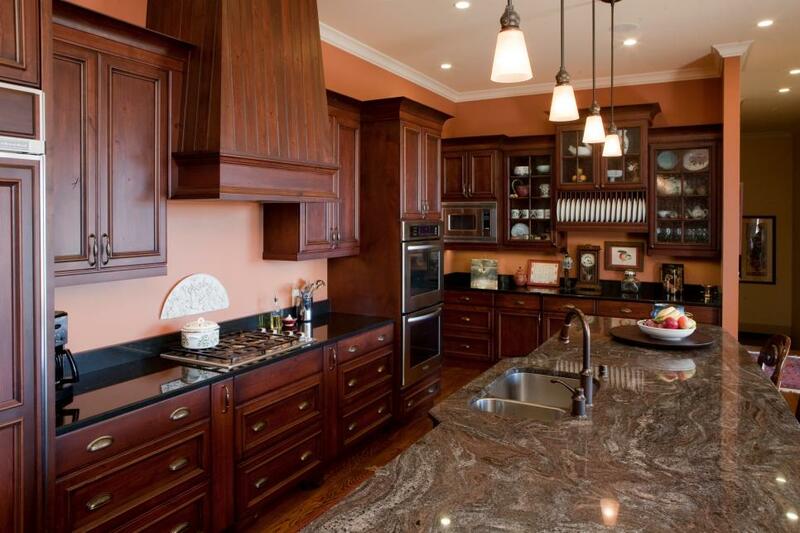 She selected white cabinets and gray countertops that can handle the orange tones that pop within the room. Especially captivating is the soft orange-colored ceiling that helps to frame the entire design. 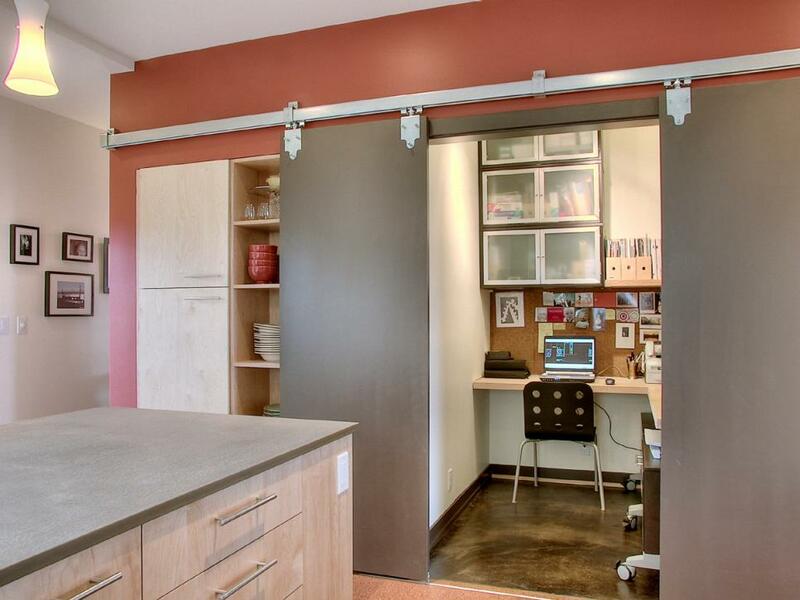 This spacious kitchen includes a small office space that can easily be concealed by a set of sleek sliding doors. 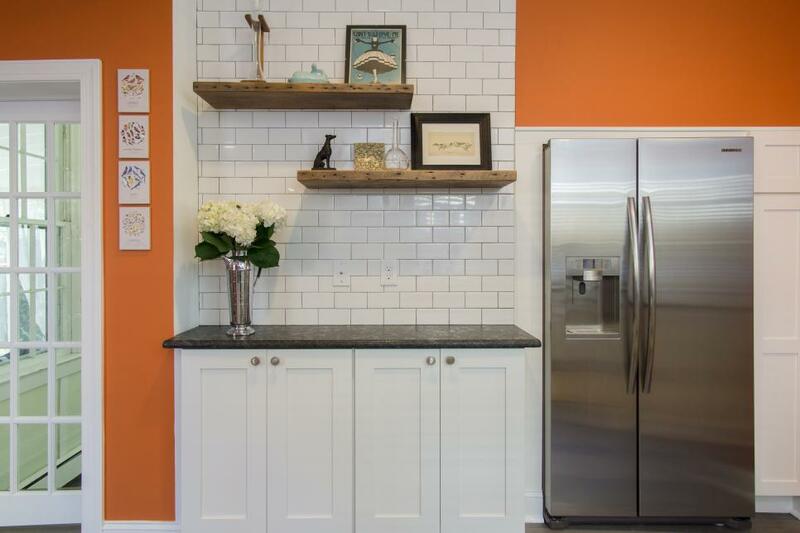 A rust orange accent wall adds a pop of color to the otherwise neutral and brown kitchen. The galley-style kitchen opens off the hall past the bedroom. 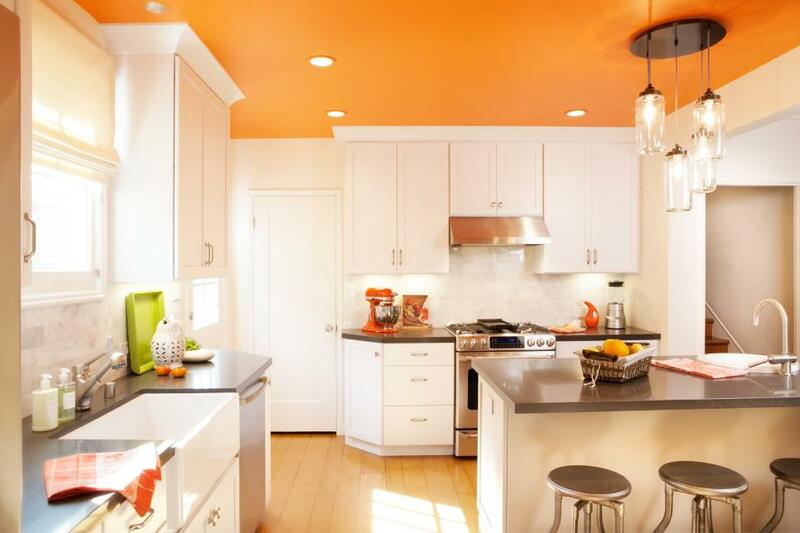 Stainless steel appliances are softened with a rich and zesty shade of orange. Open shelves hold mementos and art from travels around the world. The showpiece of the contemporary, neutral kitchen is an 11-foot island, which adds extra counter space and provides a spot for the family to eat and gather. 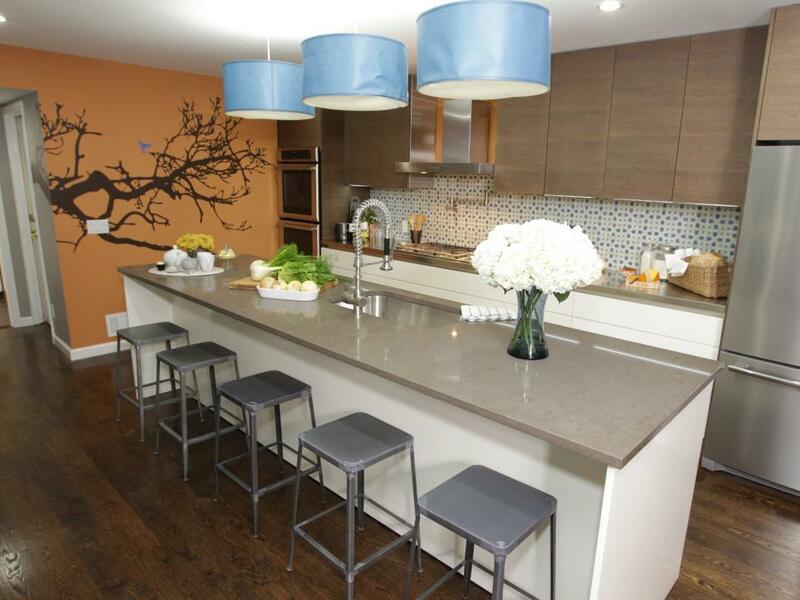 A tree decal on an orange wall provides a graphic touch and complements with wood cabinetry. The long open plan kitchen is bordered by a fireplace on one side, crisp white cabinets on the other. A narrow island both adds extra counter space and is an easy casual dining spot. 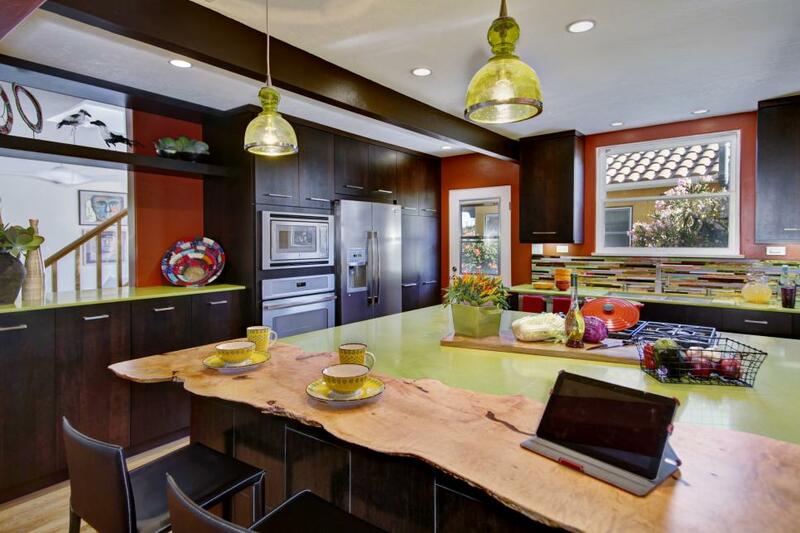 This bold, eclectic kitchen features rich brown cabinetry throughout, a spacious island with an extended countertop for dining and lime green accents. Pumpkin-colored walls add warmth and visual interest to this traditional kitchen, complimented by expansive wood cabinetry. 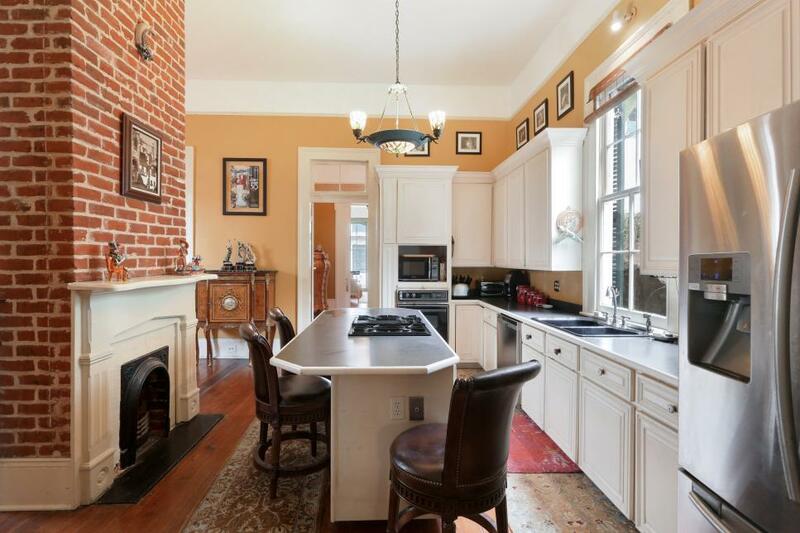 A large kitchen island flanks the room on one side, offering up ample food prep and entertaining space. 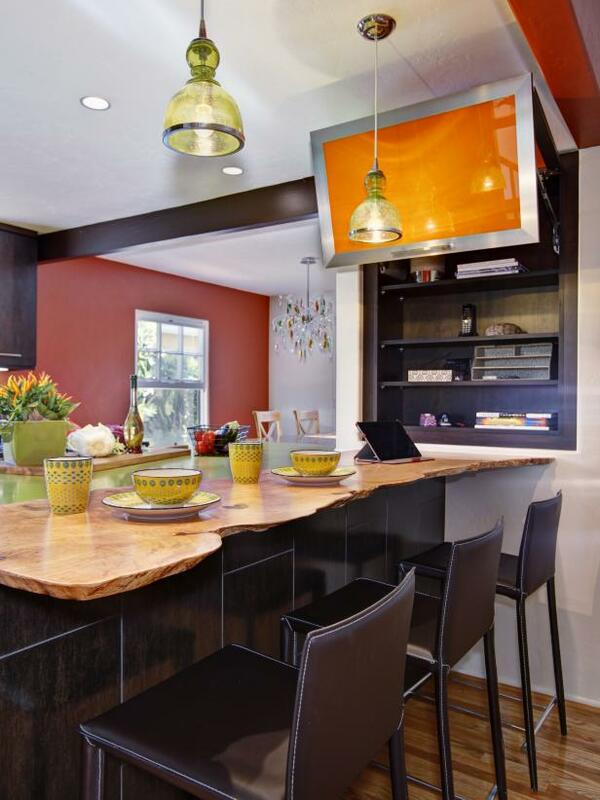 The sleek design of this kitchen pairs dark wood cabinetry with orange walls and bright white countertops. Floor to ceiling storage ensures that the counter space remains clear. 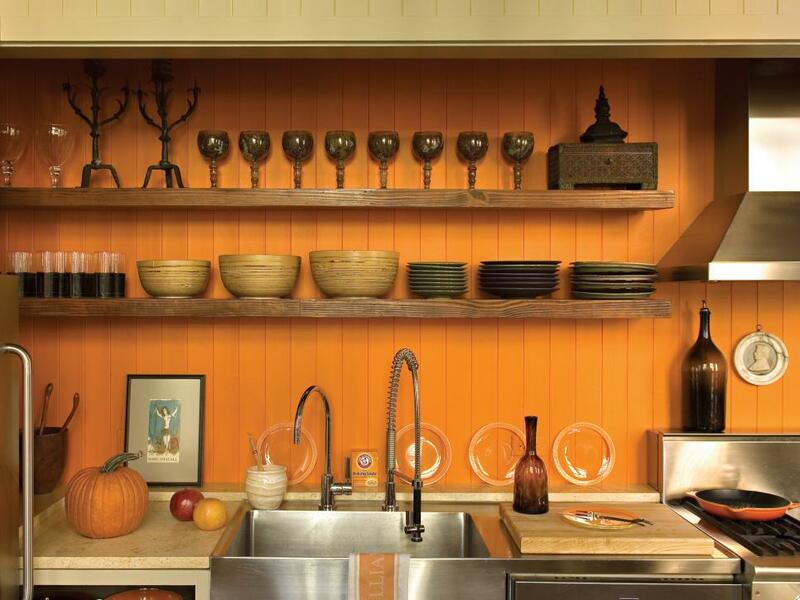 A small tile backsplash complements the orange walls. 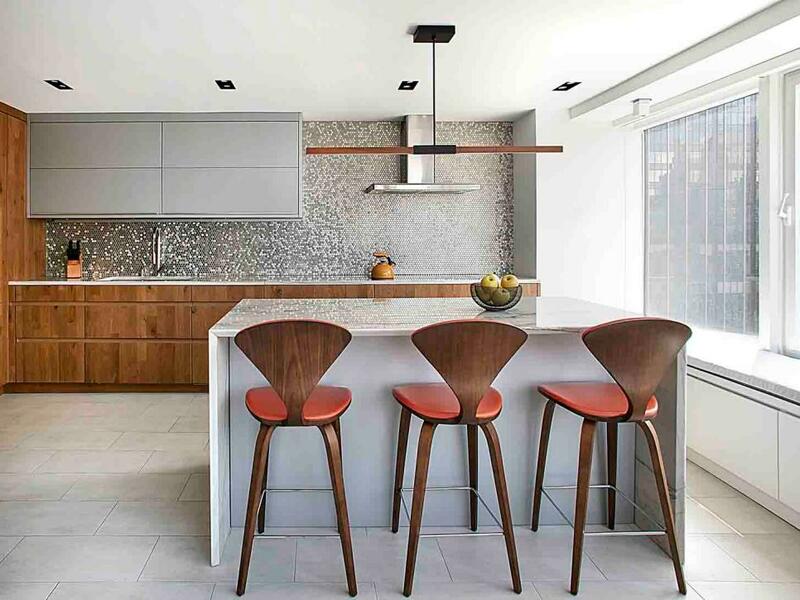 A row of cushioned bar stools are lined below the light countertop. A muddled glass panel adds a unique decoration and texture to the smooth look of the room. 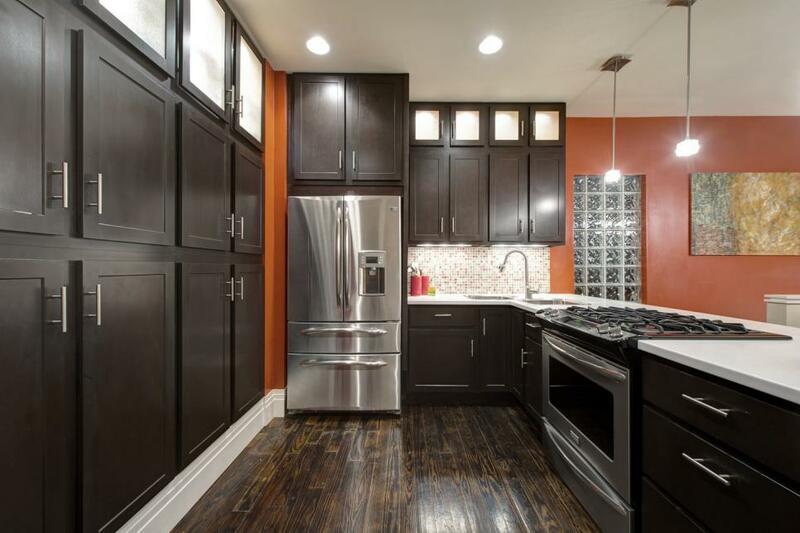 This beautiful, bright kitchen features warm orange walls and dark wooden cabinets. 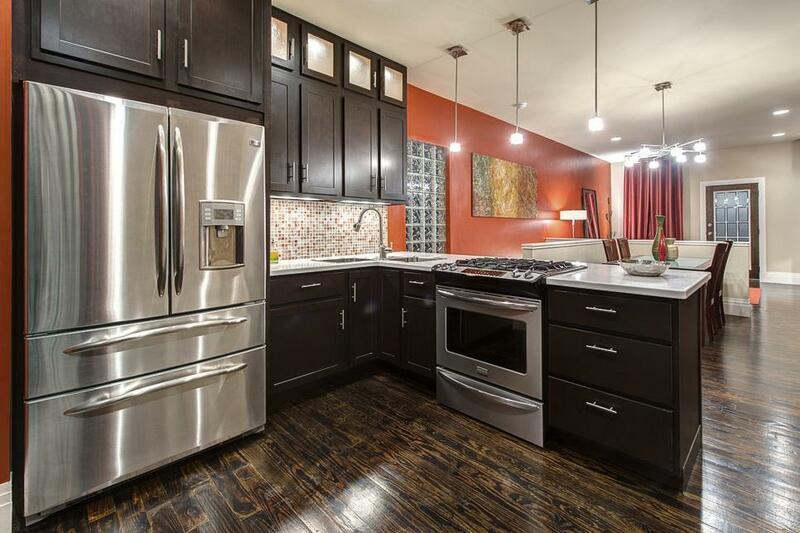 The cabinets complement the tones in the hardwood floor, providing warmth against the stainless steel appliances. Pendant lighting illuminates the crisp white peninsula countertop. The island in the middle of the kitchen serves as a center piece for people to gather, eat and drink or just prepare a meal. With a new sink and faucet from Ikea, and a built-in dishwasher, it is a highly attractive and functional spot that is sure to be a busy spot. As seen on HGTV's "Kitchen Cousins." A row of simple pendant lights gracefully illuminates the long island in this traditional kitchen. A reddish-orange was chosen for the walls, which brings warmth and a pop of color to an otherwise neutral space. Pale orange walls blend with brown wood cabinetry in this transitional kitchen by designer Kerrie Kelly. 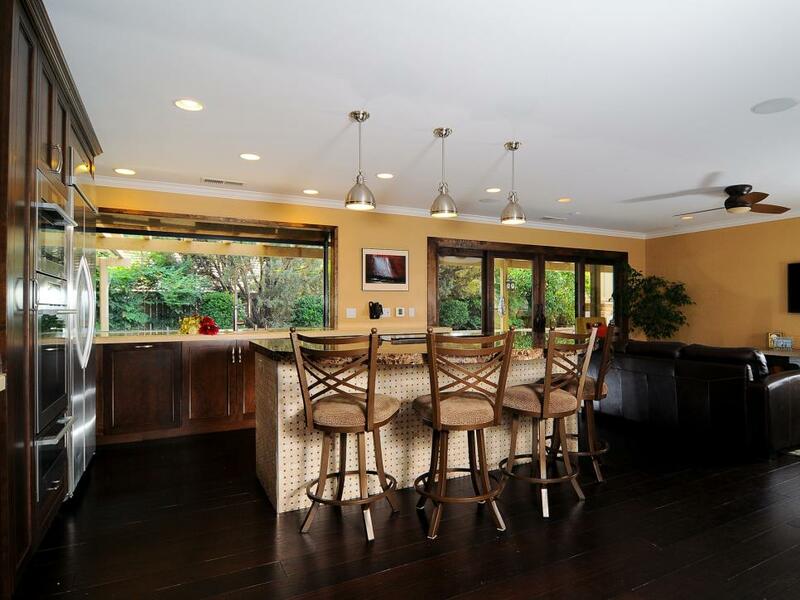 A dark wood floor runs throughout, and a trio of pendant lights hang above a kitchen island. The seating along the kitchen island faces the gorgeously green outdoor view, which becomes the real star of the space. A small kitchen island gets asymmetrical placement in this sleek kitchen, putting the prep space closer to the windows and opening up the walkway into and out of the room.